Android backup apps play an essential role to save specific settings to their server with the help of Google account. In case whenever you lost that data, you can directly restore it from your Google account. Many times in our busy routine we forgot to save some of the crucial data, and slow mobile networks may take too much time to collect that data; while back up apps help you to restore the information in less time. Some of the best android backup apps are available in the market; you can choose this method to backup of data for your androids. Here in this article, I am informing you about the android back up apps for your mobile phone which helps in data recovery from any device. These apps help you to generate your data backup and restore anytime you want. G Cloud Backup is the only app which comes with video backup. This app is one of the easiest way to use for Android users. If you love to operate simple apps, the G Cloud is for you because it protects your never-ending contact list, music, documents, videos, call logs, photos and more to secure on cloud location. You might not find backup android to pc as good as G Cloud Backup. 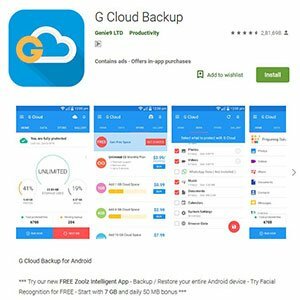 You can protect G cloud Backup app with a password. You can add more than 1 device for protection. Up to 10 GB free data will be provided. You can save your photos and videos in the sequence of their memories, i.e. you can see your first video or first clicked picture as well. G Cloud Backup has the option of auto backup for contacts, messages, documents, settings, call logs and more. You can restore your data even if you switch to other devices. Full back up may be time-consuming and might be impactful on a system of production. Size limitations impacts on backup strategies. You can use this app for back up for FREE. Titanium backup is a reliable and powerful backup tool. With this best android backup app, you are able to freeze with a pro, restore, backup your apps, data and links. This android backup and restore app come with more than 32 languages and used by 25 million users. This application need root. This app is the top root app as per twitter. This app comes with unlimited storage capacity, backup, and restoration. You can sync data with cloud providers like Google and Dropbox. This app includes all system apps, plus external data on memory card and protected apps. Ongoing updating process make this app better, secure and faster. 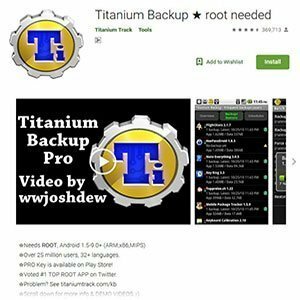 Titanium backup works properly only if it is rooted. Some users may scare of this process. Many useful features come with the paid version of this backup app which is a bit higher than other competitive apps. This app is free to use, and it’s PRO version costs the US $ 5.99. If you are looking for sms backup & restore app, then no other app is as good as Super Backup. This app takes back up and restores your apps, call logs, contacts, SMS and many more to SD card, Google Drive or Gmail. You can share APK files with friends in one touch. Backup of apps taken to SD card. Scheduled backup files will automatically update to Gmail or Google drive. This sms backup & restore app can select SMS conversations for backup. It can’t take backup of media files. This app doesn’t allow taking automatic backup from alternative cloud storage solutions. Super backup is free, but if you want ad-free and remove pop-up’s, then you have to pay the US $ 1.99. For those who are newly using backup apps, Easy backup & restore app is a simple and easy application to backup & restore in SD card and Drive. This is the perfect backup app for various storage such as drive, internal & external storage. It contains all the details of the app. With the help of this app, you can restore apps from all kinds of storage. APK file sharing is only one touch away. You can schedule auto back up. This app doesn’t work for tablets. 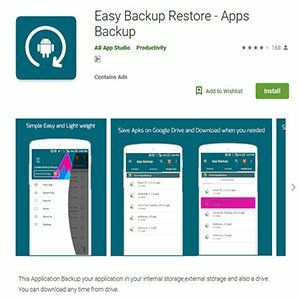 Easy backup & Restore app contains ads. This app is FREE to use. 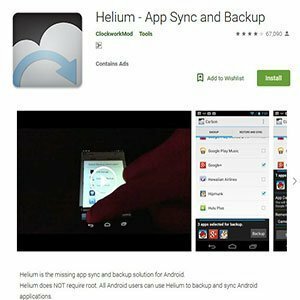 Helium is another best android backup app as its backup, restore and sync your apps from mobile. Helium has a best solution to your backup android to pc. You can take backup of almost anything in your mobile from apps to call logs, SMS, etc. The free version of this app have nearly all the features, but for removing ads, you have to download the prime version. This app works amazingly without root access. The interface of helium gives a lot of clear information in brief but comprehensive. Even if you enjoy all the features in the basic version, you may have to purchase prime version only to remove ads. This app is free, but if you want to purchase ad-free version of this app, then you have to pay US $ 4.99. My phone explorer is efficient management software because you can control your phone by connecting this app to pc. You can take your android backup to pc using this application very easily. This app helps you to organize installed apps, install, uninstall, launch, or download them to your desktop. By connecting this android app to pc, you can also handle calls, dial numbers, accept or reject a call from your desktop computer. You can do Synching of your contacts & calendar by using Microsoft outlook, SeaMonkey, Tobit David, Lotus Notes, Thunderbird and Windows Contact. You can manage to send, receiving or deleting of messages. You can use your desktop keyboard as an input device for your phone. The only disadvantage of using this backup app is it requires windows to operate. Despite this, it is the 6th best android backup app especially for windows users. 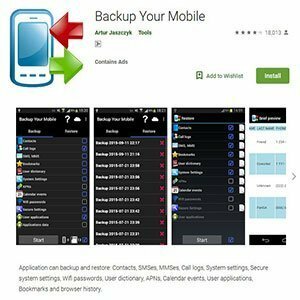 Backup your mobile app becomes the best android backup app because of it’s very fast and easy to use qualities. This is one of the powerful tools for backup and restore. AES 256 encryption is there to secure your backed up data. It allows scheduling of automatic backups so that applications will be uploaded to Google Drive, Dropbox or Skydrive. Only if your device is rooted, Wi-Fi password can be used. You can restore application data if you are connected to root only. Ads may interrupt the backup & restore process. MyBackup is one of the easy to use and reliable app for androids. Most contents with devices will be supported. 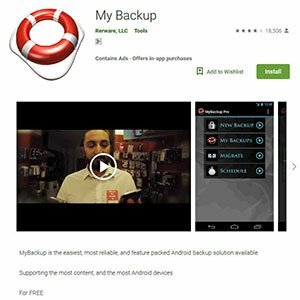 MyBackup is a complete feature pack for Android users. MyBackup has its basic and pro version as well. Your device and SD card will be backed up locally. This app allows you to take backup and restore data by using on the go (OTG) and USB cable. You can schedule backups automatically. The users who don’t access root can backup APKs and Data. Supports almost all the contents like applications, photos, music, contact, call logs, MMS, SMS, etc. With its pro version, it makes you able to backup & restores to any mobile by using the same account. You can take direct backup to your desktop from a computer with its Pro version. You have to purchase a pro version for removing ads. This app comes with only one cloud storage options. Selecting media may be difficult. Google photos app is the smarter gallery introduce by Google to store unlimited photos and videos. Your pictures and videos are organized by automatic backup; it helps you to share them faster and your phone will never run out of space. It is the safest app to take. You can enjoy free unlimited storage with the Google photos app. Need not to worry about running out of space because this app safely takes backup of your photos and videos. This app gives you chromecast support so you can see your pictures and videos on TV. No tagging is required to search peoples, place or things. The only reason not to rely on Google photos is that you lost all organized data that was set originally. At the time of saving photos in date order, you may lost any other folder. 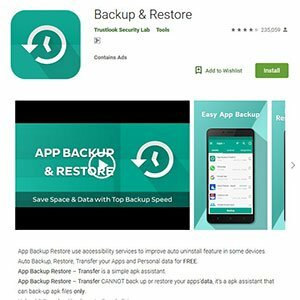 Backup & Restore is one of the great android backup apps for auto backup. This is a light app excavator to backup APK to local, and SD & cloud. Backup and Restore has facilities like auto backup & restore, transfer your phone data along with apps and widgets for free. Batch backup, restore, Share & transfer can be done by using this app. Auto backup and restore allows sending files to the 3rd party. It helps to organize apps by its name, installation date, and size. Retrieve APK files which are Compressed. This app contains ads that may interrupt or time-consuming for the backup process. 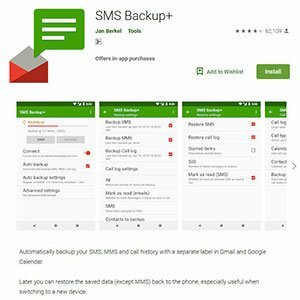 As the name suggests, SMS Backup+ is SMS back up & restore app; but this app also takes backup of call logs, MMS to Gmail, calendar, Google or IMAP. This app is entirely add-free and supported by voluntary donations. This app is in the rigorous development process from the early days of Android. This app helps to restore the data even if you switch to new device. You can schedule auto backup for SMS, MMS & call logs. As of now, its auto-update does not work properly but developing team is working on this issue. If you are looking for the app which recovers your deleted data then dr.fone-recovery & transfers wirelessly & backup app is one of the best choice for you. The undecleared world record of highest recovery rate is named under this application. This app can recover deleted photos, contacts, messages, call logs, notes, videos and more. In fact, this application is considered to be the best contacts app for android. You can easily transfer data from device to pc wirelessly. It has the highest success rate in the industry and comes with 100% security. With one click, your selectively backed up android data transfers to computer. This app serves data backup for only windows devices. Hence, all the above mentioned best android backup apps would be useful for you all to recover lost data, backup and restore your important files. These apps ensure you safe and secure data backup and restore. Tell us about your experience about these androids back up apps. Your reviews inspire us to do much better work so don’t forget to comment and share your thoughts. Stay tuned for the latest updates about the mobile industry.